Every day there is some instance where I get paralyzed by wanting everything to be perfect. For example, I’m a certified foodie perfectionist. If I’m going out to eat, I want to pick the perfect restaurant for dinner. Not just a place that has good tacos—the place that has the BEST tacos. And once I’m there, I want to pick the best taco on the menu—not just a good taco, the PERFECT taco. And I want my last bite of that perfect taco to be the PERFECT bite with each perfect ingredient represented on my perfect fork all blending in blissful perfect harmony. This tendency for foodie perfectionism usually leads me to some pretty awesome food. But in my quest for the perfect meal, I end up worrying and stressing out about each choice, instead of just sitting back and enjoying the experience. I probably could have had a just as good—or even better—experience, if I hadn’t stressed out so much about finding the perfect tacos, and instead just chilled out a little bit, found some decent tacos, and actually enjoyed them for what they are. Because let’s remind ourselves that we’re talking about tacos here, not curing cancer. Is perfection really necessary every time I eat a taco? That’s my foodie perfectionism in a nutshell, and it’s something I’m trying to work on. 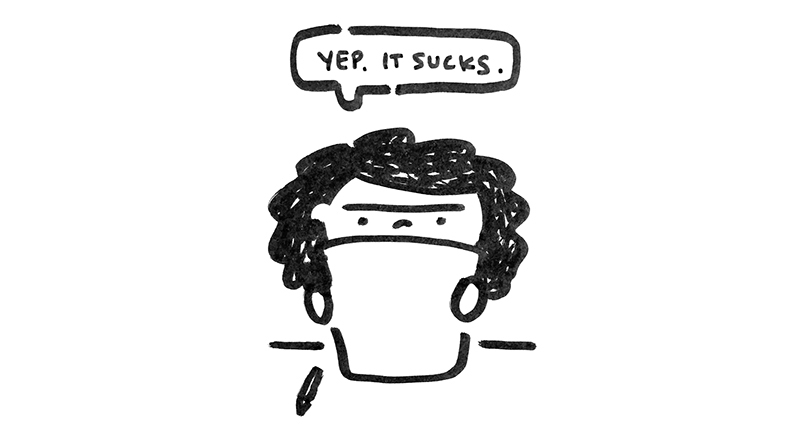 But here’s the funny part, that perfectionist tendency does not carry over at all to my art making. Most artists (both amateurs and professionals), talk often about how debilitating perfectionism is to their artwork, and how hinders their ability to create and share their work. That doesn’t happen to me. I don’t feel the pressures of perfectionism when I’m making my art, whether it’s just a doodle in my sketchbook or it’s a full-fledged project released to the public like We Are Fungi. But, ask me where to find the best double-stack cheeseburger in Atlanta, and holy moly I’ll immediately be in perfectionist mode and won’t be able to stop researching (and testing!) and will most likely never be able to give you an answer. So this realization made me ask myself: If I feel perfectionism towards food and other aspects of my life, why don’t I feel perfectionist towards my art? 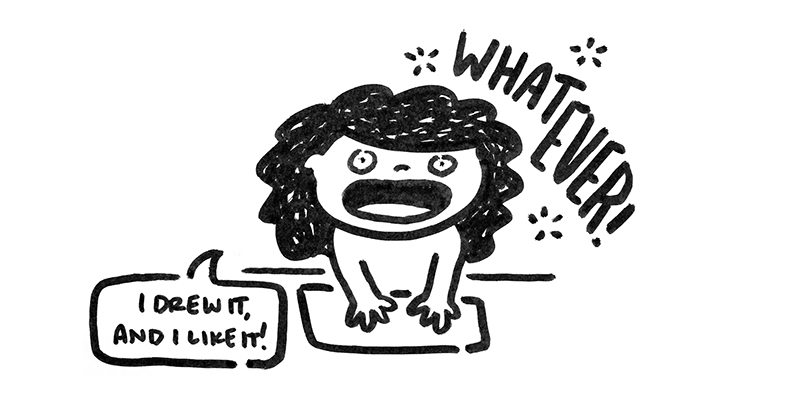 Especially when it seems like almost all artists do feel perfectionist about their art? Why not me? I don’t believe I was just born missing the art-perfectionist gene. I think I started out my artistic life just like everyone else, stressing out about my work and wanting it to be as amazing as possible. The difference is that through experience, I learned to overcome perfectionism. But it wasn’t really something I intentionally set out to do. It happened through a series of experiences. When I was in early high school, I was one of the “best” students in my art class. In full transparency, that statement’s really not saying a whole lot, because most people in that art class didn’t give a single lick about art or the class projects, and they were just there because they had to be. But still, knowing that I was one of the best in my class inflated my ego a bit. I began to believe that I could make good art, maybe even the “best” art. My art teacher also began to see my art was “good” (at least in comparison to people who don’t try) and encouraged me to jump up to the Advanced Placement (AP) Art class the next year. This too inflated my ego, and I jumped at the opportunity to move up the art ladder. At my first critique in the AP Art class, as I hung my pen drawing of a cartoon-ish camel on the wall next to the amazing, spectacular, jaw-droppingly photo-realistic pencil drawings of much classier and artsy-er topics than cartoon camels, I realized I was WAY out of my league. I had been at the top of the class in my regular art class. But now that I was in the AP art class, I was waaaaay down at the bottom. My camel cartoon looked pitiful next to these masterpieces. But here’s the odd part. At the same time I was thinking this, many other students in the class were coming to the same conclusion about their own work. Even some of the students who made the artwork I thought was amazing. Many of the students dropped AP Art the next day and switched back to the regular art class, and some even dropping out of art making altogether. I’m not kidding. That day, we all saw these examples of perfect-looking art on the wall, and we each felt that our work could never possibly be as perfect. You can quit. If your work can’t be perfect like that, then why make it, right? You can just accept the imperfection. You can look at your art as something beyond perfect. There is no perfect art for you. Maybe for other people there is, who’s to say. But for you, the point of art is to make the art and share the art. And waiting for something to be perfect is a direct hindrance to that. In every piece of art, there will always be something that could be fixed or could be better. You could have made the perspective more realistic. You could have made your pencil shading smoother. You could have not crinkled the dang page when you tried to erase something. Who cares!? You made something. Maybe it isn’t the best piece of art in the world. Maybe it isn’t perfect. But you followed through, and you didn’t quit. Your made your art and you shared it, knowing quite well that it was not perfect. That is how to not be perfectionist. No one and nothing is perfect. Even the people and the art that you think are perfect. Trust me, they don’t think their work is perfect no matter how strongly you do. So don’t aim for perfect when you’re making your art. And above all, don’t let it stop you from enjoying making your art. Your focus should be on the making, not on the end result. Once you adopt this more carefree attitude about making art, once you stop worrying about making everything perfect, you’ll feel a new sense of freedom. You’ll start feeling looser and more confident when you create. And best of all, you’ll start creating more. And that’s vitally important, because improving as an artist is just a matter of making more art. Forget perfection, and just make more stuff. 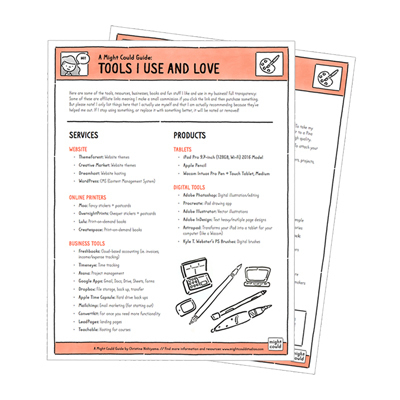 Get my list of the artist tools and services I use and love most! You'll also get my BEST content delivered for free to your inbox each week.